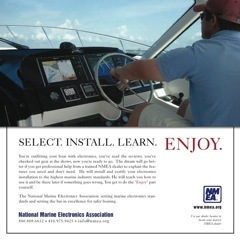 The National Marine Electronics Association wishes to thank the following magazines for participating in the NMEA Marketing Partnership Program and for publishing the NMEA "SELECT. INSTALL. LEARN. ENJOY." advertisement. If your publication is not a media partner, but wishes to become one, please contact Bruce Cole, bcole@mcnabbmarketing.com.